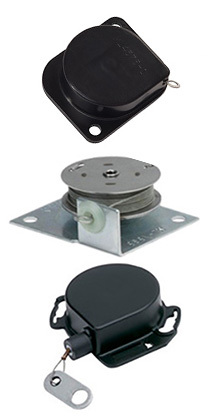 Base mounted reels are often used for repositioning cables and wiring harnesses. These reels are a popular choice for managing cables on network and server racks. Compact and lightweight, these cable retractors are a drop-in solution for design engineers and OEMs needing light amounts of tension or retraction. Our base mounted reels are available in metal or plastic. Both types use a prestressed power spring (Spirator). Metal reels have an exposed cable and spool which allows the end user to adjust the spring tension. Our plastic ML4575 series reels have a closed case construction making the spring unit tamper-proof when mounted. Both types of reel have a 2” x 2-3/8” base and are less than 7/8” in height. These compact spring reels range in force between 0.5 lbs and 2.0 lbs. Nylon coated and uncoated stainless steel cables are available. Select from our list of standard base mounted reels in this Selection Guide below where you can also find detailed information about our models.